The Hurricane is a piece based upon elemental forces. Fire, Water and Wind reflect the non-stop chaos and turmoil that seem inevitable as part of our existence, but are also anchors to the land, reminding us of the vast stillness that is all around us. Sung by Chanae Curtis, this three part song cycle is planned to be performed during late 2019. Stay tuned for updates. This spring, several pieces were developed to find a new and exciting way to link music to picture. There are many musicians who are able to turn field recordings in to engaging and exciting music, but I have gone a step further. I have taken a lot of time to develop the mindset that enables these recordings to be understood, processed, and put together in an original, musical and accessible way. I have put much consideration into how these sounds work together with tonal instruments, and how the result can start to fool our perceptions when synchronised to picture. Finding a hybrid between perceived sounds on film and music is the area that I am developing, and the super high definition of product videos with their movement, shapes and attention to detail is an interesting area to explore for this. Here is one of the latest examples of what I have been working on. It uses a violin bow on a slackened bass guitar string which was pulled to alter the resulting pitch. The result was an animalistic, wale-like sound. I have been particularly inspired by the work of Benjamin Wallfisch in films such as Blade Runner 2049. I have been using the musical and rhythmic features of distortion to create grime and atmosphere. Several pieces have been developed using the features of distortion and saturation to create atmosphere. Gritty distortion and the sense of something ‘dusty’ and tangible within the music soundtrack for film and television is a trend that I have noticed arising as a counterpart to highly polished soundtracks for films of the past. As a listener, the environment is a large part of our perception, and as we progress in an ever-noisier planet, I feel great value in bringing awareness back to the objects that make our infrastructure, reminding us of the elemental nature of our cities and countryside, finding the hidden music within the objects from which they are made. A set of pieces had been developed which could have applications in theatre and film soundtrack. This choral piece was originally commissioned by Cantores Amicitiae for their Swedish choral tour in 2016. The piece had several public performances and was later recorded for an album version at Llandaff College chapel in Cardiff. ‘We Will’ is an original contemporary ballet that follows several friends from the time that they meet, through the bond of their friendships, and as they break apart to discover their own lives. Soon they are growing past their boundaries and discovering their true nature. The ballet was jointly directed with a dancer who has worked with Ballet Cymru and the premiere was at Atmospheres Festival at the Royal Welsh College of Music and Drama in 2016 with a full orchestra. Created with the sound of branches creaking and plucked, this piece used some of the elements heard in classical orchestral music such as motifs and structure. These were then adapted to work within in the context of electroacoustic composition. The piece was made as a salute to the sounds in the forest that are too quiet to be heard without microphones. The piece had its premiere performance in the Weston Gallery at the Royal Welsh College of Music and Drama. Commissioned by the Morecambe Promenade Orchestra, this was a three-movement suite of traditional English orchestral music based upon three bird songs. The piece had several performances including it’s premier at The Platform, Morecambe. 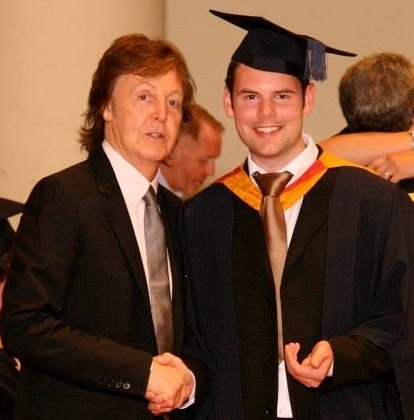 I was asked to write the music for the 2013 Graduation Ceremony of Liverpool Institute for Performing Arts, hosted by Paul McCartney. For this I wrote the main entrance music and several fanfares. Commissioned was a 5-minute original composition for two promotional videos of cycle events. The music used a bike wheel to create many of the sounds in the music. Music composer and director for a range of Spanish music that was performed live in the Paul McCartney Auditorium at LIPA as part of Lorca’s play ‘Blood Wedding’. This included much collaboration with musicians, actors, and guest award-winning director Mark Babych. Joint music director and composer for an original 40-minute dance performed at the Paul McCartney Auditorium at Liverpool Institute for Performing Arts. The piece had 4 performances to a full house and included a mix of live musicians and recorded tracks. A twenty-minute piece of music for a School dance company. The story is of an ancient tribe who are exiled from their kingdom and come together to take revenge against the evil Mask King. The piece was performed in several public venues.